LONDON--(BUSINESS WIRE)--According to the latest market study released by Technavio, the organic tea market in the US is expected to reach USD 295.1 million by 2021, growing at a CAGR of more than 5%. This research report titled ‘Organic Tea Market in the US 2017-2021’ provides an in-depth analysis of the market in terms of revenue and emerging market trends. This market research report also includes up to date analysis and forecasts for various market segments and all geographical regions. The organic tea market in the US is expected to continue its growth trajectory over the next five years, attributable to various factors related to consumer behavior and favorable market conditions, due to the availability of organic tea varieties in retail outlets and more number of organic tea manufacturers entering the market. Sales of organic tea, through the retail and foodservice sectors, increased in the recent past with consumers' preference for healthier beverage options. There is an increasing demand for organic herbal tea in the US as consumers now prefer organic herbal tea over conventional teas. This is mostly due to the increasing awareness of the associated health benefits of organic tea. Consumers are looking for organic and eco-friendly products, and are even ready to pay a premium price for such products. The organic black tea market in the US is growing with the increasing availability of various flavors and the high consumer awareness regarding the associated health benefits of the product. Organic black tea contains antioxidants and polyphenols, which help clear free radicals in the body (produced because of natural metabolic processes and due to the exposure to environmental toxins), thereby increasing the metabolic rate. “With the increasing demand for varied flavors in organic black tea, many manufacturers are now launching various flavored organic black teas. For example, Arbor Teas produces a variety of flavored organic black teas such as Organic Apricot Black Tea, Organic Decaf Mixed Berry Black Tea, Organic Earl Grey Black Tea, Organic Holiday Spice Black Tea and Organic Lychee Black Tea,” says Akash. The demand for organic green tea is high, owing to its associated health benefits. Health magazines and blogs regularly feature stories of organic green tea's weight loss capabilities. Consumption of organic green tea increases fat-burning and boosts metabolic rate. Organic green tea brewed from loose tea leaves generally contains potent antioxidants like epigallocatechin gallate (EGCG). Owing to the popularity of organic tea in the US, many manufacturers have started offering various organic green tea products. For example, The Republic of Tea produces USDA-certified organic green teas such as Organic Lean Green SuperGreen Tea Bags, Organic Serenity SuperGreen Tea Bags, Organic Immunity SuperGreen Tea Bags, and Organic Brain Boost SuperGreen Tea Bags. 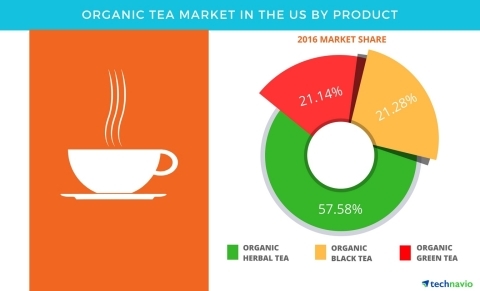 According to the latest market study released by Technavio, the organic tea market in the US is expected to reach USD 295.1 million by 2021.